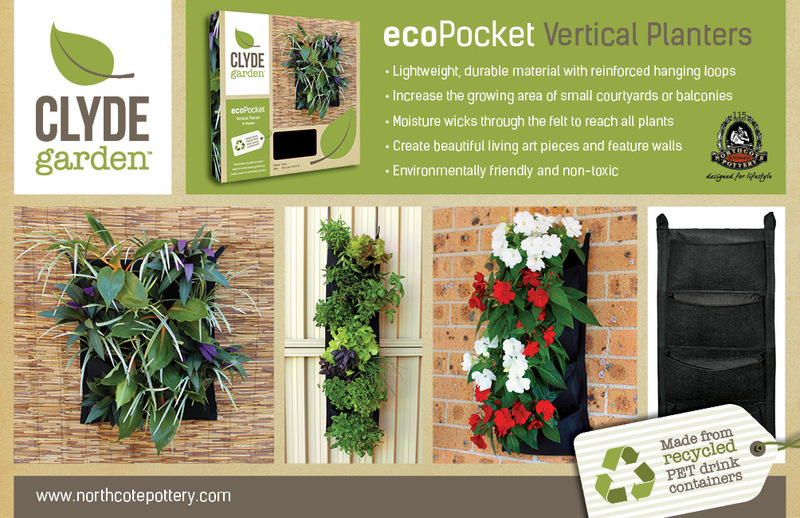 Create your own lush vertical garden with Clyde Garden ecoPockets. Easy to install and use, ecoPockets can be hung on almost any vertical surface, including walls, fences and railings. 1. Select a location for your ecoPocket, and measure the distance between the hanging loops. 2. Securely mount screws or hooks to the vertical surface, ensuring they are level. Or for a less permanent option, hang S-hooks over the desired fence/railing. 3. Hang your ecoPocket by the fabric hanging loops. 4. Half-fill each pocket with quality potting mix. 5. Remove plants from their pots, gently loosen the roots, and place into each pocket. 6. Fill in the remaining gaps with potting mix. 7. Water your vertical garden. Excess water will drain through the breathable felt. When planting your vertical garden, experiment with colour and texture. Alternate contrasting plant varieties, or use bright flowering species to create an eye-catching feature. Consider using creeping plants to spill over the edges, and fill gaps with grasses or ferns for that extra luscious look. Or fill with a variety of tasty herbs and vegetables to create an instant edible garden right at your back door!